Aksharadhool: The big joke is finally over! The big joke is finally over! Sometime back I wrote an article, 'The big joke.' about the low cost tablet computer 'Aakash,' that was supposed to have been produced in India and distributed to students at very low cost by Government of India. The contractor chosen by the Government for this project was a Canadian company ' Datawind,' owned by a person of Indian origin. Sometime in November 2012, Datawind supplied first lot of about 10000 tablets to the Government. At the same time 'New York Times' carried out an investigation about Datawind operations and conclusively found out that this entire lot of 10000 tablets was manufactured by Chinese manufacturers, who had supplied the tablets to Datawind. In fact, Datawind had not made even an effort to set up any manufacturing facilities in India till then. It was obvious that it was going to fail in its commitment to supply 100000 tablets by December 2012. 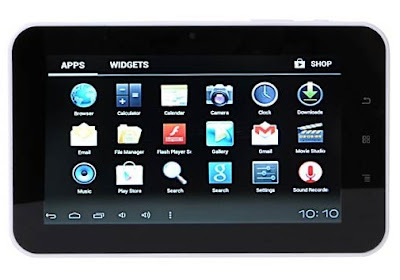 Datawind asked for an extended deadline up to 31st March 2013 to complete the supply of 100000 tablets to the Government, which, now in a bind, reluctantly agreed. Human resources ministry also wrote to IIT Mumbai, expressing its concern over the delay and asking them to ensure the vendor (Datawind) meets the terms and conditions and completes the supply by March 31 in letter and spirit, failing which, action could be initiated against it. The ministry officials now admit that till second week of March, Datawind has managed to supply only 20000 tablets against total order of 100000 pieces and it is clear that they are going to miss this deadline as well. Judging from the past experience, it requires minimum intelligence to predict that the supplies now made between December and March also must have been manufactured in China. 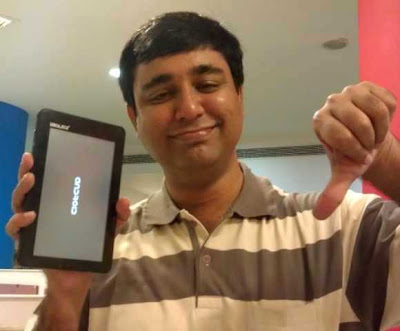 HRD ministry, in fact, had big plans for this 'Aakash II' tablet. First 100000 pieces of were to be made available to students at a subsidised rate of Rs 1,130. After this, it was proposed to make 5.5 Million tablets available. Luckily no tendering process has been yet started by the Government. Since the first 100000 pieces themselves have not been made, it is clear that the project is going to end as a big fiasco as expected. Time of India has reported the minister in charge of HRD saying; "The product is there, but we have not been able to productionise it as per the requirement. Otherwise students would have got it by now," About the future, minister only said: "one should not be obsessed with the hardware. Even if the supply of Aaakash is not there as per the requirement, there is enough device is the market catering to the low cost tablet segment." No doubt, there is a great loss of face here for the Government. HRD ministry officials now have come out with a strange statement that because of the Aakash project, an environment has been created for similar other devices in the market, which a students as well can go for instead of being too "obsessed" with the device. The ministry may now focus on improving the connectivity among educational campuses. All this only means that the big joke is finally getting over!